OMEGA’s SSRDC100V series solid state relays are dc input/dc output switching devices with no moving parts. 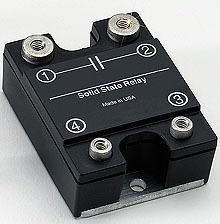 These SSR’s are capable of switching at high speeds without the noise associated with electromechanical relays. MOSFET outputs provide reliable switching.